Photo courtesy of Grey Albatross via Flickr. 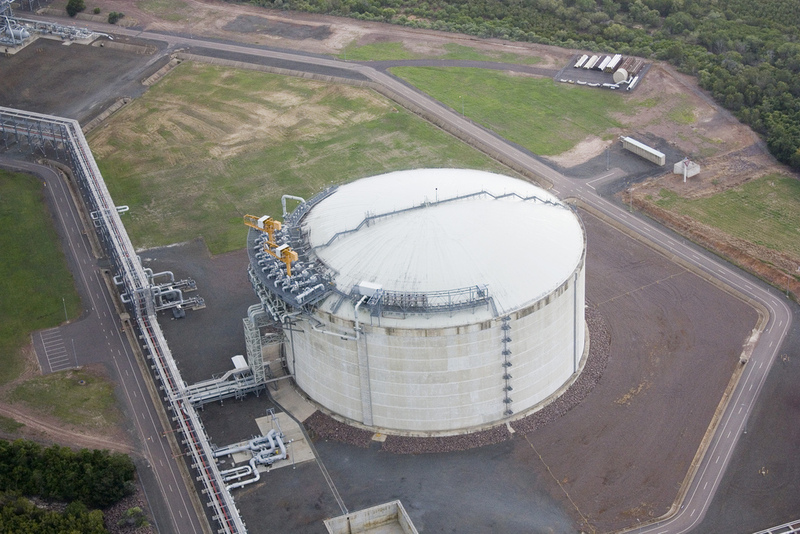 An LNG storage tank at a ConocoPhillips facility in Wickham Point, Australia. Companies are seeking approval for more than a dozen such terminals in the United States.Click image to enlarge. Should the United States export natural gas? If so, how much, from where, and to whom? Those questions have driven one of the more contentious energy debates on Capitol Hill in recent months. Oil and gas companies are extracting record quantities of natural gas from 6,000 to 10,000-foot deep shale in the United States, and interested parties across the energy spectrum are divided on what to do with the excess supplies. Just yesterday, the Minneapolis Star Tribune reported that North Dakota’s Bakken reserve could be the ‘greatest’ oil and gas find in United States history, with volumes three times higher than the U.S. Geological Survey originally estimated. The next steps attracting the most attention on Capitol Hill are more than a dozen permits under review in the Department of Energy. The department must grant permission to export natural gas to non-Free Trade Agreement countries – particularly Japan and several European nations, where the biggest potential markets are located. Lurking under the national radar, however, are the terminals’ effects on water resources. More than 45 football fields worth of wetlands fall within one proposed export site, and there are more than a dozen others like it. Republicans and right-leaning organizations believe that natural gas exports and trading partnerships should grow as quickly as possible, guided by market forces, with as little federal regulatory oversight as possible. Democrats and their allies believe in more targeted federal regulation and careful consideration — likely resulting in federal involvement — in gas exports and trading. Those pushing for more gas exports argue that limiting foreign market access means limiting profits and important new trading opportunities. Those opposing, or urging caution in pursuing exports argue that they could drive up domestic energy prices and hurt domestic industry more broadly. “When natural gas is not exported or burned for energy but instead used as an ingredient in manufacturing processes, it creates eight times more value across the economy and five times the number of jobs in the supply chain,” Andrew Liveris, the CEO of Dow Chemical, told Forbes. Political opposition to natural gas exports is significant. Powerful opponents from companies like Dow, Alcoa, and Huntsman Corporation have aligned with environmentalists and regulators to propose anti-export bills. Another factor delaying export terminals’ construction is the long, complex regulatory approval process associated with each of these applications. Water enters the equation in that process. The Federal Energy Regulatory Commission must grant companies permission to transport natural gas across state borders. A FERC spokesperson, Tamara Young-Allen, said the companies must wait for six months after they first apply while the commission reaches out to interested parties, including federal agencies and landowners, and prepares an environmental impact statement. Water resources play an important role in the environmental reviews because export terminals have significant consequences for local water resources — from wetland infringement to construction blocking waterway access. The U.S. Coast Guard has jurisdiction over federal waters around an export site, while local U.S. Army Corps of Engineers districts ensure compliance with section 404 of the Clean Water Act. Section 404 regulates the materials companies might place in waters within U.S. borders during construction. The Corps also oversees affects on any navigable waterways, based on the Rivers and Harbors Act. The overall goal? To minimize these terminals’ negative consequences for water resources as much as possible, explained Amy Klein, a regulatory program manager for the Corps. “We would prefer for [a company] to impact some degraded, low-quality wetlands versus old-growth forest,” Klein said. Of the dozen-plus terminals under review, only one has passed the six-month preliminary review phase, called the pre-filing period: a 241-acre export facility proposed by Freeport LNG Development in Brazoria County, Texas. An Army Corps review completed in 2012 found that the Freeport facility would affect almost 60 acres of non-tidal wetland and nearly 7 acres of other U.S. waters. That is the same as over 45 football fields’ worth of wetlands and waterways. Follow the Water Main for more detail on how the Freeport facility and others will shape their surrounding wetlands and waterways. And look out for more on water resources’ role in the broader political process as these terminals’ applications progress in the coming weeks.